This adjustable mobile laptop desk allows you to use your laptop while standing or sitting.You can easily adjust this notebook desk from 27.6” to 37.6” in height. The tempered smoke colored glass gives this laptop stand an elegant look that compliments almost any home or office decor. The large platform fits laptops and notebooks up to 17” and the locking castors provide a stable working platform. 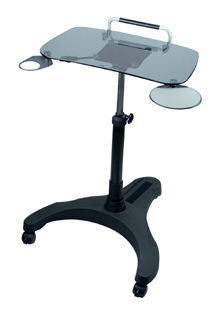 This PopDesk also incorporates a retractable mouse platform and a cup holder to help prevent unwanted spills.